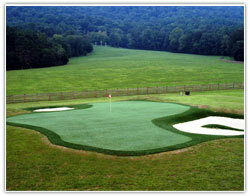 We are the premiere supplier of synthetic golf greens in the country. How good are we? Twenty-five PGA professionals have our product in their yards, including Vijay Singh, Hale Irwin, and Sergio Garcia. Golf lover Vince Gill sings the praises of our synthetic golf green in his back yard. Nicklaus Design recently entered into all exclusive agreement with us for golf course design. These guys don't mess around with less than the best, and neither should you. Our expertly installed golf greens are custom-built to best meet your golf needs and the natural terrain of your yard. The play and feel of our product is as close to the real thing as you can get. All shots are possible on a Southwest Green. From bump and run chips to pitches to sand shots, even holes in one, you'll be amazed at the feel of our golf green arid how it mimics natural grass. But seeing is believing. We have several sites in the area boasting our technology, and we would be happy to let you experience our product first-hand with a tour of one of these sites. Once you see it for yourself, and discover how cost effective one of our golf greens is, you'll want one. Knowing we provide a 7- year warranty will give you peace of mind, too. Contact Southwest Greens today for more information on our indoor golf putting green systems. I wanted to take a minute and let you know how much we are enjoying the new Southwest putting green you installed in our backyard. We have had many comments about how “true” the ball rolls and how “real” the surface plays. I especially appreciate how little maintenance the surface requires to keep it in first class condition. Everyone that comes over enjoys rolling a few, whether they are serious golfer or not! I would also like to commend the professionalism of Gary and your entire installation team. They started on the agreed upon date and finished on time. They also kept the site clean during the entire process. In closing, I would recommend a Southwest putting green to anyone who is serious about golf, or simply has a love of golf. The green is a big hit with all of our friends and provides an outdoor gathering place that is fun for everyone. Thanks again for a job well done! How long is putting green installation and construction? What type of artificial and synthetic products do you offer? Why type of quality are the artificial and synthetic golf greens? Will my golf game improve by owning a backyard putting green? What Nashville golf course information can be found on ...? What Nashville golf resort information do you have? Do you offer Nashville golf package information on your website? What are some good ideas for a Nashville golf vacation? What Nashville golf retirement community listings do you have?